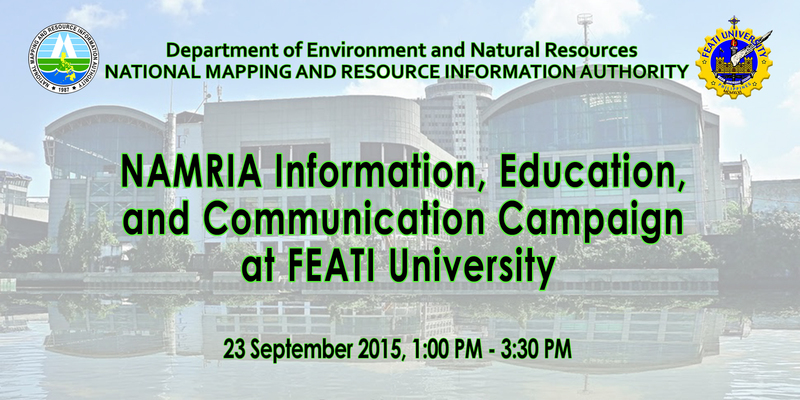 In line with NAMRIA’s efforts to introduce itself to the general public by way of increasing public awareness on the role of the agency in national development, an Information, Education, and Communication (IEC) Campaign was held at the audio-visual room of FEATI University on 23 September 2015. 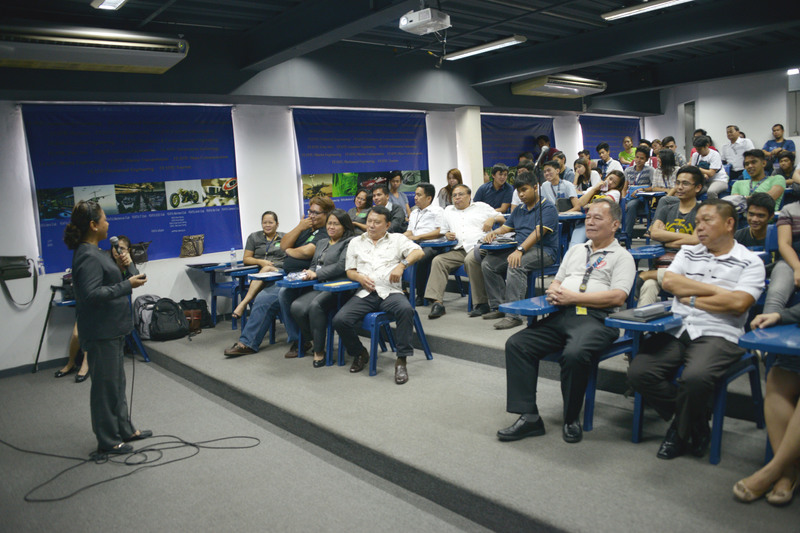 The campaign featured a day-long exhibit of NAMRIA’s products and services at the fifth floor main lobby of the university building number 2 and a three-hour lecture held in the afternoon detailing the functions and major projects of NAMRIA. A career talk after the presentation was also held. 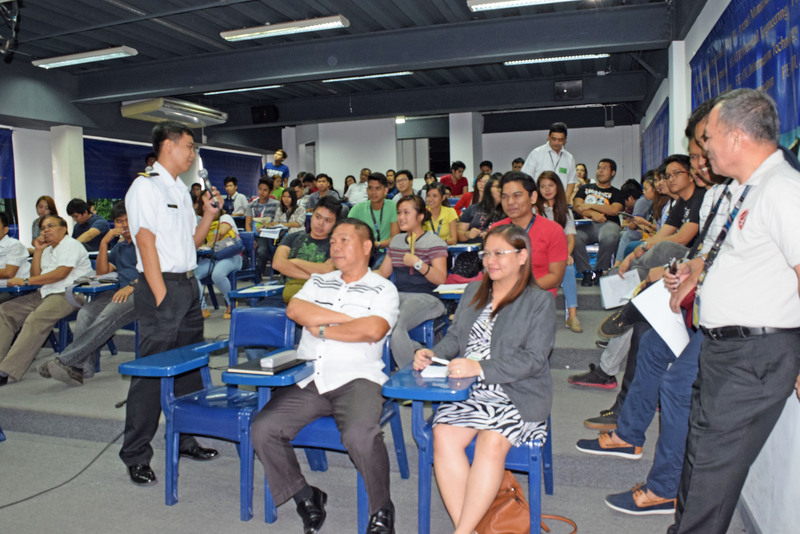 The participants in the lecture were second- to fifth-year Bachelor of Science (BS) in Geodetic Engineering and BS in Civil Engineering students of the University’s College of Engineering (CoE). The exhibit showcased the following: 2010 Land Classification Map of the Province of Bataan; Coastal Resource Map of the Province of Batangas; Nautical Chart nos. 4723A (Kalayaan Island Group and Recto Bank including Bajo de Masinloc) and 4726A (Benham Rise); Map of the Philippines-Indonesia Exclusive Economic Zone Boundary; Interferometric Synthetic Aperture Radar (IfSAR) image of Mayon Volcano; and IfSAR and Very High Resolution Stereoscopic Images of San Fernando City, La Union, and Baguio City. Actual live demonstrations of the Philippine Geoportal and SeeMyENC Viewer also formed part of the exhibit. The lecture started with the opening remarks of FEATI University-CoE Acting Dean, Engr. Alfredo F. Villarin. He welcomed and thanked the students for their participation and encouraged them to listen well to the discussion. This was followed by the presentation of the general topic outline of the activity and the brief discussion on NAMRIA’s organizational structure by Geospatial Information System Management Branch (GISMB)-Geospatial Information Services Division (GISD) Information Officer Carina A. Santos. This was followed by presentations of the functions and major projects of the four technical branches of NAMRIA by the resource speakers. Engr. Charisma Victoria D. Cayapan of the Mapping and Geodesy Branch discussed the mapping process and the Geodetic Network Development including the Unified Mapping Project and the Modernization of the National Geodetic System. Forester Pinky T. De Chavez of the Resource Data Analysis Branch presented the land cover, coastal resource, and land classification mapping activities. Ltjg. Aaron Andro V. Ching of the Hydrography Branch (HB) focused on the nautical charting activities. Information Officer Alvin F. Laurio of GISMB gave an overview of the Philippine Geoportal Project, which carries the “One Nation One Map” advocacy of the government in promoting one common multiscale basemap. Mr. Laurio also presented the agency’s products and services and the procedures for their availment. Human Resource Management Officer Agnes G. Radam of the Support Services Branch delivered her career talk after the presentation of the technical branches. She primarily discussed the strategic initiatives of the agency by enumerating the benefits and opportunities of being employed in NAMRIA. Another career option was presented by Ltjg. Lorena Jasmin D. Lerio of HB. In her presentation, she discussed the cadet competitive examination. She motivated and encouraged the students to enter the government service via the said examination and be one of the few and select hydrographers of the country. The open forum held after the lecture gave the students the opportunity to clarify with the resource speakers certain points from their presentation. A ceremonial handover of NAMRIA’s token of appreciation to FEATI University was done after the open forum. GISMB Officer In Charge-Assistant Director, Engr. Nelson M. De Leon handed the book Bajo de Masinloc (Scarborough Shoal): Maps and Documents to Engineer Villarin and FEATI’s Department of Geodetic Engineering Chairperson, Engr. Enrique A. Macaspac. The students were also each given a NAMRIA centennial calendar as token for participation in the lecture. GISD-GISMB Chief Maria Romina DR. Pe Benito explained to them how to use it. In his closing remarks, Engineer Macaspac thanked the NAMRIA IEC team for their efforts to reach out to their stakeholders. “Maraming salamat sa inyong lahat (NAMRIA IEC Team) at kayo pa talaga ang pumunta at lumapit sa amin para lubusan kayong makilala ng aming mga estudyante,” he said.